Another wonderful sermon on Sunday. We were reminded about “Doubting Thomas” who had to see in order to believe. Faith and doubt is difficult to write about. We all believe right up until we start to doubt. Our doubts can help us to keep a check on our faith, never taking it for granted. You can imagine the theological discussions that Thomas must have had with his fellow disciples after he declared he’d have to see to believe. Our doubts center on how far we should wade in. How much are we willing to risk by stepping out and living parts of our life according to our beliefs. Doubt describes this tension between risk and trust. Poor Saint Thomas. More like all the rest of us than perhaps any other disciple. At least during this event. He had been left out of the visitation of the Risen Christ, off doing something else and had missed the glorious moment. What must he have been thinking, what could have been more important? He’d been left out of the big adventure and must have felt lonely, angry and/or even discouraged. Maybe we spend too much time being miserable about our past mistakes. Future hopes and dreams can dull the here and now. We miss so many chances because we’re not living in the present. Thomas was literally absent. So to can we be absent from our faith and miss the very presence of Christ. Sometimes God will come and get right in your face. Jesus certainly did that with Thomas. Thomas paid attention to his encounter and it changed his life forever. He was ready to believe. I’m afraid that I’ve too often been looking in the wrong direction. Too often filled up with myself. Thomas put all that aside and reached out with faith and grabbed a hold of his Savior. What about you? Are you always ready to believe? The Christian faith is a lot like that encounter Thomas had with Jesus. It’s very “hands-on.” You can’t coast along on the faith of someone else. You can’t sit in the pew for too long and hope to make it when that 800 year flood hits. You have to get up and wade into your belief. 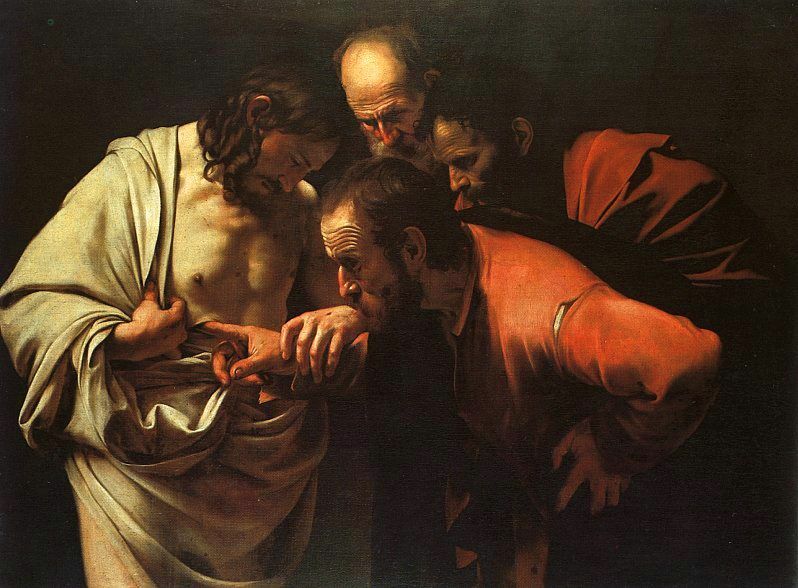 Thomas was challenged to stick his fingers into the very side of the Risen Christ. What must he have thought as Jesus looked him in the eye and grabbed his hand? If you are going to follow Christ, you are going to have to take some risks and even get uncomfortable. Where are those boundaries in your life? Thomas had to see with his own eyes. He had heard the words of faith for for three years. Now it was time to put it into real practice. He just didn’t realize the time was now. Everything was moving so fast. Walking in faith is often like that, it can sneak up and suddenly challenge us to get out of the boat and step into the storm. Are you becoming one of the blessed? There’s nothing wrong with doubts. Jesus didn’t reject Doubting Thomas, he made a special visit to assure him. God isn’t mad because we don’t believe enough, he’s instead offering so much more, encouraging us to believe more and more each day. It all makes me wonder, why am I not demonstrating my faith so that others have something more to see? What might walking and talking my faith produce? It would increase my own eternal health. Each time I take a step of faith, I confront my own doubts. I reassert in my heart and mind why belief is so crucial. Putting faith into practice confronts my own weakness and lethargy of spirit. Instead of blending in all the time I could provide an alternative. I can live my life as an example to the unbelieving elements of my culture. My life choices can serve as a beacon. My walk of faith can inspire the faith of others. There are people in my path who need to be encouraged to live a life of faith. I can be like Thomas to those around me and demonstrate doubts converted into undying faith. A-Men! Help mine unbelief !